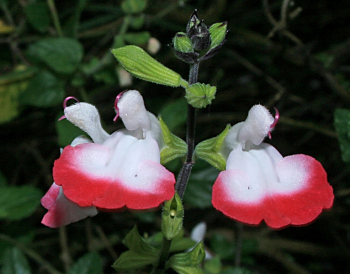 Salvia microphylla 'Hot Lips'; an example of a red & white funny looking hardy Shrubby Salvia! First this will be virtual on my blog, but hopefully I will soon be able to grow all these lovely plants into a fantastic collection in reality! Like the popular variety above, which has the funny bi-colour! But there are also many blue ones or violet and pink or do we call it maroon or purple, and yellow as well as all other colours in between! They are beautiful: grown for their very vivid colours, mostly flowering en masse, for long periods on end and they are easy to fit into any area of your garden or grown into a container on your patio. Another less known fact is that the foliage often has a delicious fruity fragrance. 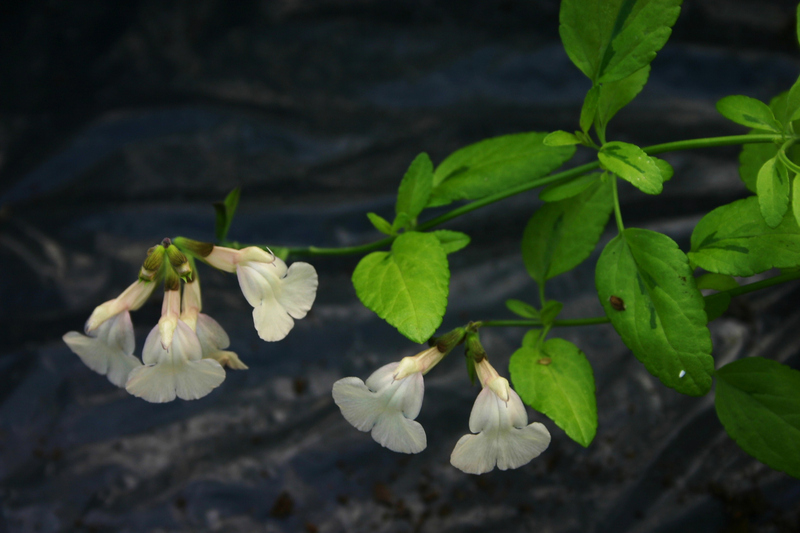 My love affair with the Salvias began in the last century; in 1998 to be precise! This is since I became Head Gardener at Rodbaston College, which is now after amalgamation with 3 other colleges in the County, known as South Staffordshire College, Rodbaston Campus near Stafford in the U.K. The collection had been started by the former Head Gardener, with the then Head of Horticulture , who both thought it would be a good idea for the College to have a National Collection and they decided it should be the genus Salvia. But when I started to get to know the genus and in particular the New World ones with all its different species, cultivars and hybrids I slowly built it up to be 'National Collection of New World Salvias', which it gained official status in 2002. Three expeditions to southern Mexico, mainly in the State of Oaxaca and the organisation of a Salvia Study Day at the College in 2004 (together with the HPS Staffordshire Group) got me more and more hooked. I made several very influential friends in the Salvia world to which I still owe my gratitude. My story below and in the following chapters mentions several very influential people in the Salvia world for me and in particular in Britain. I have copied some information from several books about Salvias, as these are often in better words then what I can write myself. You'll find links for these books, so you can purchase them yourself if you want! They are certainly worth it if you get hooked! First there was John Massey, who owns Ashwood Nurseries near Kingswinford south of Wolverhampton and has, if you take a look at the link, 110 different varieties for sale at present! John gave me many of his plants to try out in the collection at the College. Salvia x jamensis 'Moonlight over Ashwood' is a cream & green variegated leaf selection from Ashwood with light peach flowers. Salvia 'Robin's Pride' a vigorous selection of seed of 'Hot Lips' grown by Robin. Then one day I got a letter from Robin Middleton, who is now THE Salvia-King of Britain! 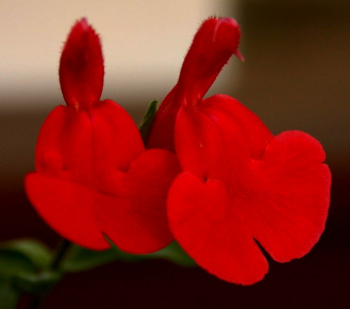 He has a most wonderful website full of information and a gallery of stunning Salvia pictures and many of those lovely salvias he is also growing in his small suburban garden! Click on his name to get to his website. Eventually we also met up and he was so generous too, giving me all his surplus plants to enrich the collection with. The collection grew out to eventually more than 300 varieties, which covered different species from mostly the New World; some species were perfectly hardy, especially being protected inside the old, walled garden. All these hardy ones I hope to grow in my 'Salvia Paradise Garden' one day! But then there were many tender varieties as well, which was perfectly ok as they adorned first the old and then later the new greenhouses which were built for us in 2005 at Rodbaston College. I had to give it all up when I left the College in 2009 and now we are nearly a decennia further. Today I had the universe shining on me, as I think, ...... but don't say it too loud, just in case it is a dream? I may have found some premises to grow my first few salvias! We had a tip through the former boss of my partner to have a look and enquire at this nearby nursery, which has been a nursery since the 1920s so we were told by the now sole owner there since 2001! She rents out all the various buildings and polytunnels on site and also makes a living of breeding poultry, ducks and peacocks / hens. She showed us the entire site and then we walked into a vacant tunnel which had a 10 meter x 1.80 meter (?) propagation bench in it, which will be perfect to start my collection! Can't wait to start buying in my 'Mum' plants! I already know that I would like to grow most of the same ones I used to have at Rodbaston College and I've tracked many of them down to several nearby nurseries. Yoke started her Yoke’s Magic Gardening business in April 2012. 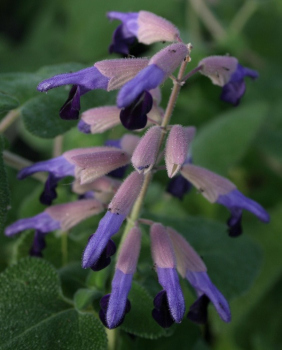 She has also recently (January, 2019) started growing a very colourful plant called the Salvia again, of which she used to have a National Collection at former Rodbaston College in Staffordshire. 0 Comments To "Yoke's Salvia blog Chapters 1&2"